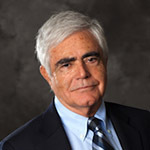 Requicha is the founding director of the USC Viterbi Laboratory for Molecular Robotics and is known for his pioneering work in nanotechnology. Prior to his nanotechnology research, he helped develop the solid modeling technology widely used in industry, where it has replaced traditional drafting and enabled large improvements in productivity and cost. He received the Engenheiro Electrotécnico degree from the Instituto Superior Técnico, Lisbon, Portugal and his Ph.D. in electrical engineering from the University of Rochester. Nanorobotics, nanotechnology, sensor/actuator networks, robotics and automation, swarm robotics, 3-D geometric modeling, computer graphics, artificial intelligence.